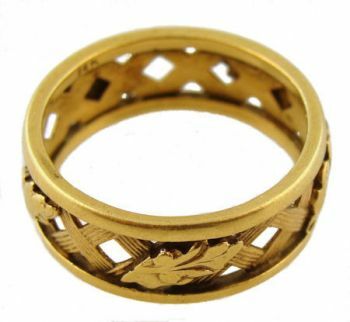 Description: A vintage 14k yellow gold 7.0mm wide wedding band that has a continuous hand wrought oak leaf & trellis pattern. 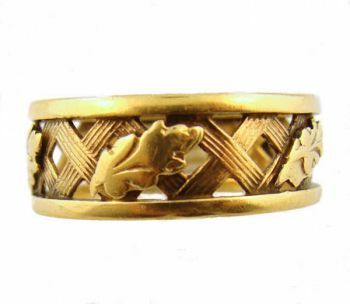 The oak leaves are applied to the hand pierced and patterned trellis work pressed between two gold bands. Weighs 3.1 grams. 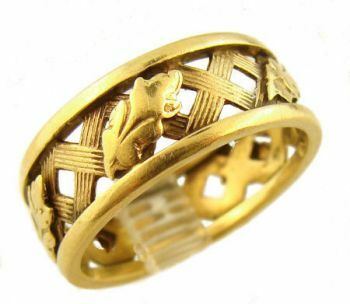 Stamped 14k. Circa 1940's. Oak trees have symbolic meaning referencing them to being the king of trees known for their strength and endurance. As a living legend representing all that is true, wholesome, honorable, hospitable, faithful and virtuous. Measurements: Measures 7.0mm in width by 1.3mm in height/depth. Size 6. Band not re-sizable. Shipping time: Ships in approx. 1 to 3 days.